For today’s first Sunday Reader Question, I thought I’d answer a question that I get all the time, which is: What is your favorite destination? Don’t get me wrong, I’ve got a lot of them. I’m a huge fan of Madrid, and I’ve been to all sorts of other exotic, fascinating destinations like the Seychelles, Cambodia and more. But I have to say that my all-time favorite trip was the one I took this past January to South Africa. I know it’s a long way to fly, but it is definitely worth it! You don’t need a visa for stays of up to 90 days, and the exchange rate makes a trip here reasonably inexpensive, even if you’re going out and doing a ton of things. 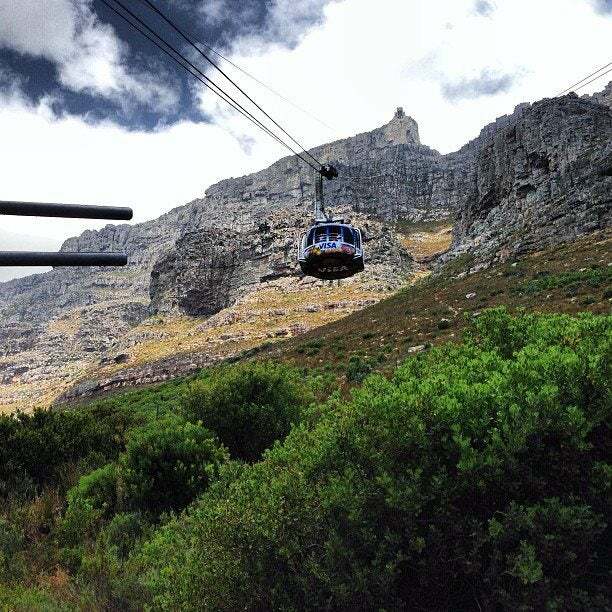 Taking the cable car up Table Mountain. Plus, Cape Town has a bunch of great points hotels you can choose from, including where I stayed last time, at the Westin and the Hilton. 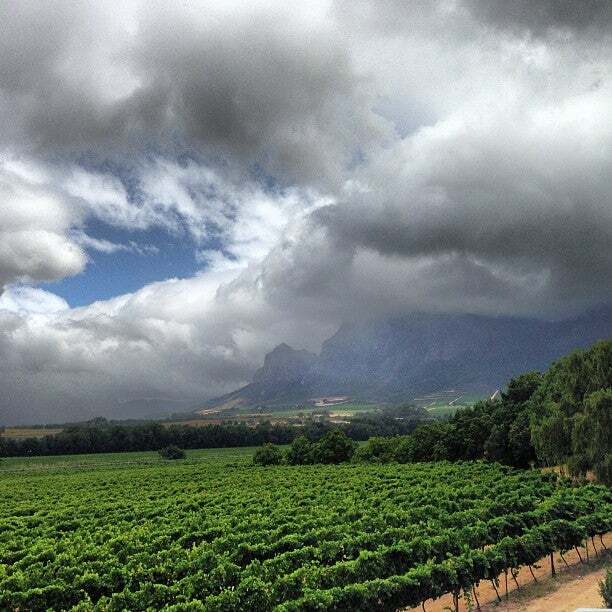 The Vrede en Lust vineyards in Franschhoek, just 45 minutes from Cape Town – absolutely stunning. I’m currently in Cape Town, and I’ve been having another fantastic time in this great city. Just 45 minutes outside of town you have the world-class wine regions of Stellenbosch and Franschhoek, while nearby you have everything from a gorgeous coastline of rugged beaches to the iconic sight of Table Mountain, and an incredible dining scene with delicious restaurants. It’s almost like a little slice of Europe at the southern tip of Africa. Security is an issue for some people, but as long as you take the usual precautions you would in any big city, like not venturing down dark streets in areas you don’t know, not flashing money or jewelry around, and just using plain common sense, you should be fine. I can’t say enough good things about Cape Town and South Africa – it’s the perfect spot for a trip of a lifetime, whether it’s a honeymoon, an anniversary trip, or you just want to get away, you can’t go wrong with South Africa. For more on what I love about South Africa and all the things I did there, check out my series on my trip from January. Posts include: Come Along With Me To South Africa! ; Flight Review: South African Airways Business Class JFK-JNB; Hotel Review: Westin Cape Town; Trip Report: Watching African Penguins at Boulders Beach and the Cape of Good Hope; Cape Town Dining; Hotel Review: Hilton Cape Town; Hotel Review: 12 Apostles Hotel and Spa Luxury Room; Trekking Up Table Mountain In Cape Town; Hotel Review: Hyatt Regency Johannesburg; Trip Report: South Africa Safari at Savanna Lodge in Sabi Sands Private Game Reserve; Safari Highlights at Sabi Sands Game Reserve in South Africa, 10 Things I Love About South Africa.